Glucosamine is an amino sugar and a prominent precursor in the biochemical synthesis of glycosylated proteins and lipids. A type of glucosamine forms chitin, which composes the exoskeletons of crustaceans and other arthropods, cell walls in fungi and many higher organisms. Glucosamine is one of the most abundant monosaccharides. It is produced commercially by the hydrolysis of crustacean exoskeletons or, less commonly and more expensive to the consumer, by fermentation of a grain such as corn or wheat. Glucosamine is commonly used as a treatment for osteoarthritis, although its acceptance as a medical therapy varies. 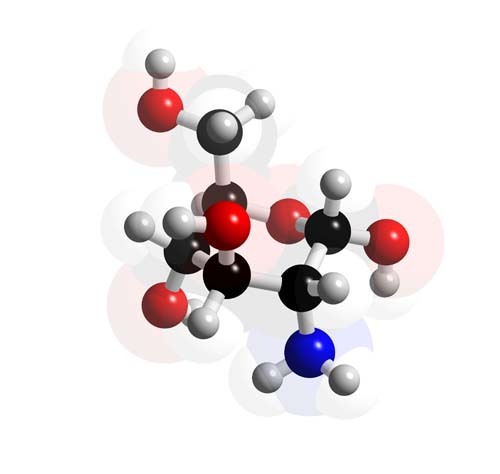 Glucosamine was first identified in 1876 by Dr. Georg Ledderhose, but the stereochemistry was not fully defined until 1939 by the work of Walter Haworth. D-Glucosamine is made naturally in the form of glucosamine-6-phosphate, and is the biochemical precursor of all nitrogen-containing sugars. Specifically, glucosamine-6-phosphate is synthesized from fructose-6-phosphate and glutamine as the first step of the hexosamine biosynthesis pathway. The end-product of this pathway is UDP-N-acetylglucosamine (UDP-GlcNAc), which is then used for making glycosaminoglycans, proteoglycans, and glycolipids.